By now, one would have to be living under a rock to not be aware of the allegation of inappropriate behavior/invasion of personal space made by Lucy Flores against former VP Joe Biden. Read the story here. Lucy alleged that Biden kissed her head and made her feel uncomfortable. That allegation led to others “claiming” inappropriate behavior on the part of Joe Biden. Well, as far as Flores goes, while there is no evidence of Biden committing the act she says made her so uncomfortable, there IS evidence that Lucy was all up in Biden’s personal space. LUCY, YOU HAVE SOME ‘SPLAININ TO DO! Lucy, girl, your hands are on this man’s body! YOU are standing awfully close. YOU are smiling like a Cheshire Cat! Make this make sense, Lucy. Is touching allowed only when YOU are the perpetrator? You claim you don’t have a political agenda, but I’m not buying it. 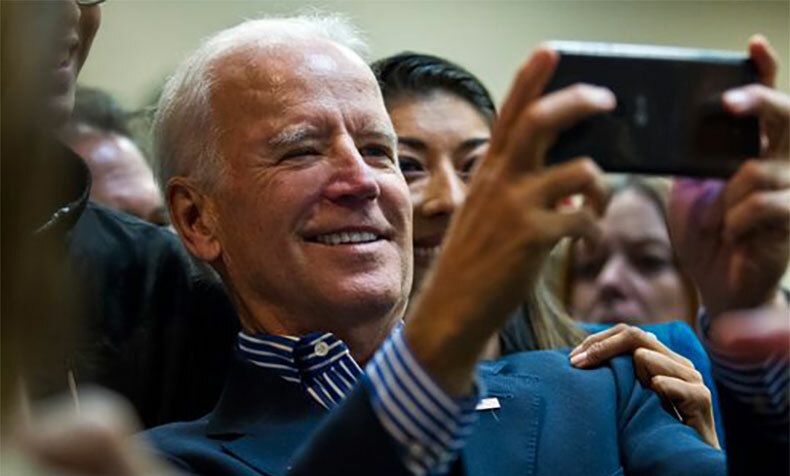 If you don’t want to vote for Biden, don’t do it; however, clutching your pearls and claiming Biden invaded your personal space, all the while being Miss Octopus with him isn’t going to cut it. Bernie supporters crushing other potential democrat candidates, get your popcorn ready! Look at that stink eating grin on Joe's face! It's pretty clear Lucy's other hand is in Joe's pants!! Pervy Auntie Lucy!!! Both democrats. Both creepy. Both have an agenda. The Democratic Party is nothing but a grotesque side show. Any decent American should be ashamed to be associated with this disgusting group. Thank God the real Americans elected Trump. We would have never seen the true depth of depravity that is the Democratic Party. Lucy (Gooosy) the same laws that can and maybe will help you now were in place when Biden fondle, violated you. What I am having trouble grasping is why did you wait till now to complain. I have been a teacher for over 35 years and I have never had a problem addressing issues with adult students. When I said/say NO I MEAN NO. Ms Leslie, are you trying to be the Aunt Jemima here in Florida? You write words that suggest that Joe Biden is a good guy, let me inform you, this man is one of the oldest Original Drug War Architects, Many of the original architects of America’s drug war have retired or passed away. Biden remains one of the few still in power—and may soon reach for more. I agree Leslie,... you "outed" "Lucy's Lies"; "social climbers" (of ALL stripes) need to learn how to " work for it"; "pandering" is only lucrative on street corrners...(or by apparently victimizing weak old men like "Plugs Biden" ). Not a supporter of any Democrat candidate, but find it interesting how some of them want to destroy their party and the country in the process. Biden is no doubt the strongest candidate they've got so if they want to win over the American voter they'd be well advised to support Joe because none of the others can come even close to beating Trump in 2020. Go Trump ! Humpty Trumpty is W-A-Y M-O-R-E C-R-E-E-P-Y than "Uncle Joe"! A thousand times more creepy ... for a hundred times more reasons! Biden doesn't need the bu**sh** at this stage in his life. He should pick an announced candidate that he can support with great enthusiasm ... and go forward helping that candidate to win! (And, Obama should do the same thing.) The critical thing that the Dems MUST do is ... become the majority in the Senate. Control of the House and Senate is more important than winning the presidency. You're "whistling into the wind" 'VD2020' and making sounds like a "bleating sheep"! Heh, heh, heh. Mr. Breezy complaining about somebody else "whistling into the wind" is pretty oxymoronish, isn't it? This must be some kind of record, our resident bigot submitted a piece that doesn't contain the race card. Congrats Leslie! Sorry but too Pale and too Stale Creepy Uncle Joe just doesn't cut it in today's Hate America Party. He's not an anti Semite, probably isn't too keen on Infanticide and I doubt he believes farting cows cause global warming. If this WAS a "race" "Harry", you would be well on your way to losing,.. So, turn in YOUR "card" ! You must be the resident racist. What’s wrong? Leslie’s columns struck home with you?? People have been talking about this perv for a long time, this is not new news. You always have to question someone's motives when they never complain until years later when someone is getting more press than them... Great pic!